Micromax has launched cheapest priced CDMA mobile phone Micromax Q1C in India. 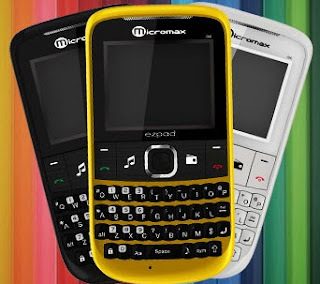 QWERTY keypad and LED torch is basic feature of Micromax Q1C mobile phone. The Micromax Q1C comes with 2-inch TFT display with 220 x 170 pixels screen resolution, multi format music player, Stereo FM Radio, 3.5 mm audio jack, internal memory and up to 2GB expandable memory support through microSD slot card. The Micromax Q1C low priced mobile phone also supports Wap data connectivity and fully loaded with embedded games. 1000 mAh powerfull battery gives long battery life of up to 5 hours talktime. Just Rs. 1,500/- buy from any telecommunication.